A joint paper, expressing serious concerns about the Commonwealth Government’s My Health Record has been released by three of Australia’s leading peak bodies for consumers of mental health services. ‘We’ve joined together to tell people with mental illness: if you’re in doubt, opt out,’ says Shauna Gaebler, CEO of CoMHWA, the West Australian peak body for mental health consumers. ‘My Health Record increases the risk of discrimination and health inequalities for people with mental illness. Until we know there are reliable protections, and answers to our concerns, we can’t ethically encourage people to stay in this system,’ Gaebler said. 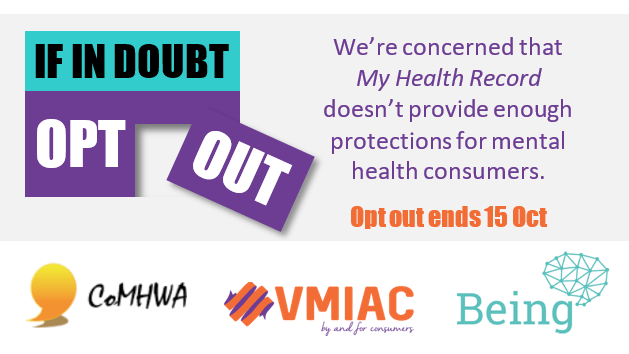 This week began a three-month process for Australians to opt out of My Health Record. After 15 October people can choose to close their record, but their record contents will not be deleted. ‘Our members face discrimination in almost every aspect of their lives,’ said Maggie Toko, CEO of VMIAC, the Victorian peak body. ‘We die 20 years younger than the average Australian, in part because many health workers can’t see past a diagnosis of mental illness to look for signs of physical health problems.’ This is a phenomenon called ‘diagnostic overshadowing’, which is well known to contribute to delayed diagnosis of many life threatening conditions, including cancer. ‘My Health Record increases the risk of privacy breaches already faced by consumers in health services, particularly when there’s violence and abuse within families,’ said Irene Gallagher, CEO of NSW peak body Being. Almost all people admitted to hospital-based mental health services have a history of trauma. Much of this trauma occurs in families, including child abuse and family violence. ‘My Health Record makes it too easy for potential abusers to access health records, or even change them, if the person is deemed to ‘lack capacity’, said Gallagher.